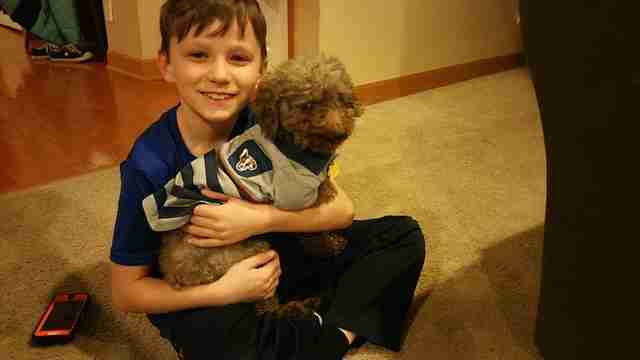 In November 2017, Shey the 14-year-old miniature poodle was dropped off at the Animal Rescue League of Iowa for the saddest reason: His family was moving, and they weren’t taking him with them. For the next four months, Shey waited and waited at the shelter for someone to pick him. He was suffering from dental disease and had never been neutered, so the rescue got him scheduled for surgery and vet care. Only one of his teeth wasn’t fully rotted. 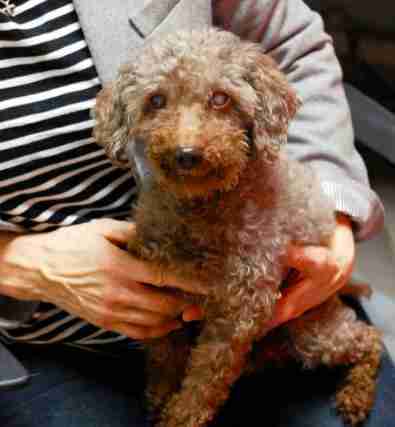 Being deaf, half-blind and almost completely toothless, there wasn’t exactly a line out the door of adopters waiting to meet him. But when a young boy named Tristan came in one night last week, none of that mattered. 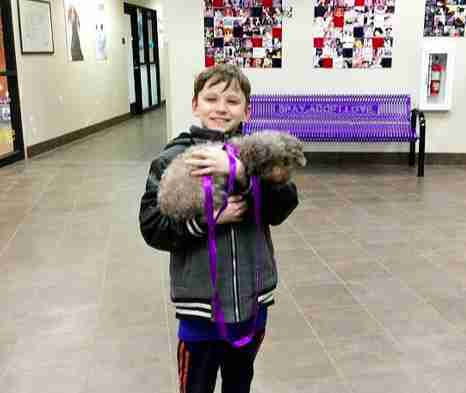 He and his mom were looking for a small dog who loved cuddles, and the shelter staff knew Shey would be a perfect match. Tristan excitedly took a seat, ready to meet his new potential pal. When the staff placed Shey into Tristan’s lap, the look on the boy’s face was one of pure joy. “Shey was very comfortable with Tristan from the beginning,” Jorgenson said. 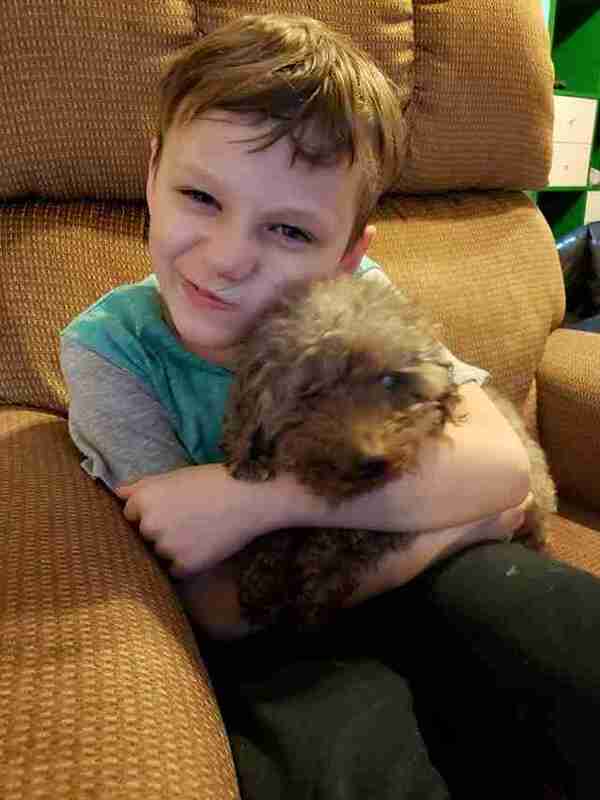 As the adoption staff went over some of Shey’s special needs, Tristan held onto every word — clearly willing to do everything he could for the sweet little dog cuddled up in his lap. When reviewing Shey’s medical history, Tristan even pulled out a calendar on his phone and started jotting down when he’d need to bring him to the vet for future vaccinations. He told the staff all about the special spot in his room he had set up for him, too. Now comfortably at home with his family, it’s clear Shey has already found a new favorite place to be: in Tristan’s arms. Although Shey’s wait for a family was months long after being abandoned, Tristan is doing everything he can to make up for lost time. To help more dogs like Shey, you can make a donation to Animal Rescue League of Iowa.